"Dozens of stranded pilot whales have been shot dead in New Zealand to end their suffering when it was ruled too difficult to get them back in the sea." "The Australian navy has denied its ships were behind the mysterious deaths of whales in Tasmania. At least 130 pilot whales died ..."
"Whale, dolphin and porpoise strandings have doubled in the UK over the last 10 years to 782, according to a new study." "A swift ascent from deep water may be just as dangerous for whales as it is for humans, Science magazine reports." "Conservation workers and local residents have managed to save dozens of pilot whales which became stranded on a remote island off New Zealand. Rescuers succeeded in refloating 39 of the 159-strong pod"
"Environmental campaigners in America are concerned about a new danger to the world's whale population. It's sonar - powerful sound waves used by submarines and ships to track activity underwater." To map the ocean floor, the oil and gas industry typically relies on airguns, long submersible cannons that are towed behind boats in complex arrays, firing shots of compressed air into the water about every ten seconds. The intense pulses that they produce travel down through the water column, penetrate the seafloor, and rebound to the surface where they can be analyzed. A large seismic array can produce peak pressures of sound that are higher than those of virtually any other man-made source except explosives - over 250 decibels. If the seafloor is hard and rocky, the noise might be heard for thousands of miles; under the right conditions, it can reverberate in such a way as to sound nearly continuous, masking the calls of baleen whales and other animals that rely on the acoustic environment for breeding and survival. A substantial body of evidence shows that the great bursts of energy used in probing the seafloor can kill, injure, and disturb a wide variety of marine animals, including fish, marine mammals, squid and other life. This form of ocean noise can have a range of serious impacts on marine species, from hemorrhaging of tissues and strandings, to temporary or permanent hearing loss, to abandonment of habitat and disruption of vital behaviors like mating and feeding. High-intensity sounds are known to pose a unique danger to marine mammals, in part because of the important role that acoustics play in marine ecology and in part because of the great distances and diverse range of habitat over which intense sound can propogate underwater. In addition to their long melodious songs, humpback whales let out moans, grunts, shriekes and blasts that are both low and high-fequency sound waves. The sound travels 10,000 miles through ocean water without energy loss. In 2002, in the Gulf of California, Mexico, two beaked whales (Ziphius cavirostris) were found to have stranded coincident with geophysical surveys that were being conducted in the area, by the same ship that is slated to survey the Chicxulub crater. That same year, adult humpback whales were reported to have stranded in unusually high numbers along Brazil's Abrolhos Banks, where oil and gas surveys were conducted. Studies suggest that critically endangered western Pacific grey whales were displaced from important feeding grounds and exhibited behavioral changes in response to seismic surveys off Russia's Sakhalin Island. Other marine mammal species known to be affected by airgun arrays include sperm whales, whose distribution in the northern Gulf of Mexico has been observed to change in response to seismic operations; bowhead whales, which have been shown to avoid survey vessels to a distance of more than twenty kilometers while migrating off the Alaskan coast; and harbor porpoises, which have been seen to engage in dramatic avoidance responses. Although most research to date has been devoted to marine mammals, seismic exploration is a problem whose impacts affect a wide range of species, including sea turtles. Loggerhead turtles have been shown to alter their swimming in response to airgun noise, and there is concern that intense noise may drive them and other species to the surface, where they are more vulnerable to ship strikes and predation. Given their swimming patterns, the amount of time they spend underwater, and the difficulty of spotting them from the deck of a seismic ship, it is also feared that these species would be exposed to the highest levels of sound. In January-February 2004, over thirty endangered sea turtles washed up on the beaches of the Yucatan, Mexico, following seismic testing conducted by PEMEX, suggesting that, like marine mammals and other species, sea turtles are driven to strand by intense anthropogenic sound. Impacts on commercial species of fish have also been shown. In one series of studies, it was demonstrated that airguns can cause extensive and apparently irreversible damage to the inner ears of pink snapper - damage severe enough to compromise survival - even at exposure levels that might occur several kilometers from a source. Other studies suggest strong behavioral reactions. In Norway, for example, catch rates of cod and haddock fell dramatically (between 45 and 70% in the vicinity of an air gun array, affecting fisherman across an area nearly 5000 sq km in size, and did not recover within five days after operatons ended. Researchers have also begun to investigate the impacts of seismic on invertebrates. According to one current study, two multiple giant squid strandings off the coast of Spain appear to be linked spatially and temporally to the use of air guns there; the squid showed lesions that have never before been seen in the species. Meanwhile, a preliminary report out of Canada suggests that airguns can physically injure snow crabs. Studies such as these have begun to outline the dimensions of the risk that seismic work entails. It is clear that seismic surveys risk widespread injury and disturbance of diverse marine species, from the largest whales, to dolphins and other marine mammals, to numerous species of fish, to invertebrates such as squid and crabs. Countries can and should work to ensure that seismic exploration surveys in their waters are conducted in ways that lessen these harms. The airgun, which replaced dynamite as the industry's primary method of exploration, is not the only technology used today. Other methods, which also produce impulsive noise above 200 decibels (dB), include sleeve exploders, gas guns, sparkers, and boomers. In addition seismic survey vessels typically employ multi-beam and sub-bottom profiling sonars whose source levels run as high as 237 dB (RMS) and 200 dB (RMS) respectively. Richardson, W.J., Greene Jr, C.R., Malme, C.I. and Thomson, D.H., Marine Mammals and Noise (1995) (table 6.6). The decibel scale is like the Richter scale: it expresses force in logarithmic terms, rising in increasing orders of magnitude from a baseline value. Each ten-decibel rise along the scale corresponds to a ten-fold increase in power, thus, a sound measuring 130 dB is considered ten times more intense than a 120 dB sound, a sound of 140 dB is 100 times more intense, and a sound of 150 dB is 1,000 times more intense. International Whaling Commission, 2004 Report of the Scientific Committee: Annex K (reporting data on nearly continuous sound produced by seismic surveys); Nieukirk, S.L., Stafford, K.M., Mellinger, D.K., Dziak, R.P., Fox, C.G., "Low-frequency whale and seismic airgun sounds recorded in the mid-Atlantic Ocean", J. Acoust. Soc. Am. 115(2004): pp.1832-43 (describiing significnt propagation across mid-Atlantic to hydrophones located more than 3000km away); Croll, D.A., Clark, C.W., Acevedo, A., Tershy, B., Flores, S., Gedamke, J. and Urban, J., "Bioacoustics: Only male fin whales sing loud songs", Nature 417 (2002); p.809 (observing that rise in noise levels from seismic surveys, oceanographic research, and other activities could impede recovery in fin and blue whale populations). Hildebrand, J., "Impacts of anthropogenic sound on cetaceans", Paper submitted to the IWC Scientific Committee (2004) (SC/56/E13). Engel, M.H., Marcondes, M.C.C., Martins, C.C.A., O Luna, F., Lima, R.P. and Campos, A., "Are seismic surveys responsible for cetacean strandings? An unusual mortality of adult humpback whales in Abrolhos Bank, Northeastern coast of Brazil", Paper submitted to the IWC Scientific Committee (2004) (SC/56/E28). See Wursig, B.D., Weller, D.W., Burdin, A.M., Blokhin, S.A., Reeve, S.H., Bradford, A.L., Brownell, R.L., Jr., "Gray whales summering off Sakhalin Island, Far East Russia: July-October 1997, A joint U.S. - Russian scientific investigation", Final contact report to Sakhalin Energy Investment Company (1999); Weller, D.W., Burdin, A.M., Wursig, B., Taylor, B.L. and Brownell, R.L., Jr., "The western Pacific gray whale: A review of past exploitation, current status and potential threats", J. Cetacean Res. Manage. 4 (2002): pp. 7-12. See e.g. Mate, B.R., Stafford, K.M. and Ljungblad, D.K., "A change in sperm whale (Physeter macrocephalus) distribution correlated to seismic surveys in the Gulf of Mexico", J. Acoustical Soc. Am. 96 (1994): pp. 3268-69 (sperm whales); Richardson, W.J. ed., "Marine Mammal and Accoustical Monitoring of Western Geophysical's Open-Water Seismic Program in the Alaskan Beaufort Sea, 1998" (1999) (LGL Rep. TA2230-3) (bowhead whales); Malme et al., "Investigations of the potential effects of underwater noise from petroleum industry activities on migrating gray whale behavior", (1983) (BBN Rep 5366) (gray whales); pers. comm. with Dr. David Bain, U. Washington (Nov. 10, 2003) (harbor porpoises). Lenhardt, M.L., Seismic and very low velocity sound-induced behaviors in captive loggerhead marine turtles (Caretta carreta)", in Proceedings, Fourteenth Annual Symposium on Sea Turtle Biology and Conservation (1994) (NOAA) Tech, Memo. NMFS-SEFSC-351); McCauley, R., Fewtrell, J., Duncan, A.J., Jenner, C., Jenner, M.-N., Penrose, J.D., Prince, R.I.T., Adhitya, A., Murdoch, J. and McCabe, K., "Marine seismic surveys: Analysis and propagation of air-gun signals, and effects of air-gun exposure on humpback whales, sea turtles, fishes and squid" (2000) (Curtin University Centre for Marine Science and Technology Report R99-15); O"Hara, J. and Wilcox, J.R., "Avoidance responses of loggerhead turtles, (Caretta carreta), to low-frequency sounds", Copeia (1990): pp. 564-67. Secretaria de Medio Ambiente y Recursos Natuales, Direccion General de Vida Silvestre, Delegacion Federal en Campeche, "Relacion de tortugas varades en la costa de Campeche del 20 de Diciembre de 2003 al 12 de Febrero de 2004" (2004) (chart documenting strandings). McCauley, R., Fewtrell, J. and Popper, A.N., "High intensity anthropogenic noise damages fish ears", J. Acoustical Soc. Am. 113 (2003): pp. 638-42; see also McCauley et al., "Marine seismic surveys". Engas, A., Lekkeborg, S., Ona, E. and Soldal, A.V., "Effects of seismic shooting on local abundance and catch rates of cod )Gadus morhua) and haddock (Melanogrammus aeglefinus)", Canadian J. Fish. Aquatic Sci. 53 (1996): pp. 2238-49. Southern right whale Eubalaena australis were once so abundant off New Zealand's coasts that whalers would anchor in east coast bays to wait for them to arrive. The total population is now reduced to about 8,000 which is 10 percent of their original number, and they are rarely seen. The life of most marine animals, especially fish and marine mammals, is dependent on sound for navigation, feeding, breeding, predator avoidance, and family connection. Sound is used as the principal sense, because vision underwater is only good for tens of meters. But sound can be heard for thousands of kilometres, travelling five times faster than sound in the air. Sound in the ocean has the equivalent importance in supporting life, of sunlight above the surface. Anthropogenic sound, or noise pollution in the ocean, is a recently identified problem that must be addressed with the same vigor as pollution of the Earth's atmosphere. Ocean background noise levels have doubled every decade for the last six decades in some areas, mainly due to shipping (IWC 2004). Because there is no light, life in the ocean is completely different than life on land. The natural resources of the ocean must therefore be managed differently, particularly exploitive industries such as oil and gas, and mining. Ocean noise is not contained within localised areas. Its impact is widespread over vast areas of ocean that will affect many aspects of marine life. Noise from just a single seismic survey can flood a region of almost 300,000 sq.km, raising noise levels 100 times higher, continuously for days at a time (IWC 2004). Seismic noise from eastern Canada measured 3,000km away in the middle of the Alantic was the loudest part of the background noise heard underwater (Nieukirk et al. 2004). There have been extensive seismic surveying of the seabed around New Zealand and throughout the EEZ using air guns, by the government research vessel RV Tangaroa, in the concerted effort of Crown Minerals to attract oil and gas exploration in five offshore basins. Surveys are also conducted by exploration companies. Seamounts along the Kermadec Ridge have been mapped extensively using multiple-beam sonar. Seismic surveys have also been done on individual seamounts during Nuclear and Geological Sciences research expeditions, and by Neptune Resources to determine the extent of sulphide mineral deposits around hydrothermal vents. Seismic surveys for gold prospecting of the seabed by Seafield Resources Limited are about to commence along more than 400km of territorial sea on the west coast the South Island covering an area of 10,178 sq.km from Karamea to Jackson Bay. The South Island's west coast is the favoured place for endangered Hector's dolphin Cephalorhynchus hectori hectori, the world's smallest dolphin which is found only in New Zealand waters. The Maui dolphin C. hectori maui is critically endangered and found only off the west coast of the North Island. There have been more whale strandings on New Zealand's shores than any other country. There are many possible causes of strandings, however, it is reasonable to assume that seismic operations have caused strandings in New Zealand. The extensive evidence of correlation between seismic operations and cetacean strandings and deaths at overseas locations, and the extent of seismic operations and the relatively high presence of marine mammals in the New Zealand region support this assumption. The Department of Conservation recognizes the potential for seismic survey operations to "have an adverse impact on marine mammals". DoC has prepared "Guidelines for Minimizing Acoustic Disturbance to Marine Mammals from Seismic Survey Operations which apply to the entire EEZ. The guidelines, which have been endorsed by the Petroleum Exploration and Production Association of New Zealand, require the shut down of seismic survey operations if whales are sighted within one kilometre, and a slow startup. The guideline is a compromise that lacks the statutory power of legislation in the EEZ which has not been enacted. It is limited, since it is voluntary with no recourse for punishment for violation. It is also made with an oil and gas industry association, not with individual prospecting companies. No agreement has been made with mineral prospecting companies. There is no apparent scientific evidence that whales cannot be harmed one kilometre from seismic blasts. Whales are known to have avoided vessels conducting seismic surveys by as much as 20 km. Seismic air guns have been shown to severely damage fish ears, most likely permanently, at distances of from 500m to several kilometres from seismic surveys (McCauley et al. 2003). Despite the large number of stranding fatalities, insufficient research is being conducted to determine the cause. 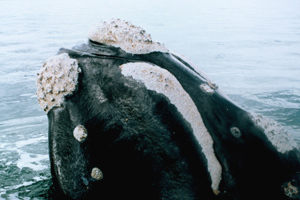 In particular, more autopsies of dead whales from mass strandings need to be done. The mass stranding of 129 pilot whales in which 21 died on Puponga Beach on 20 December 2005, and another 49 pilot whales nearby at Farewell Spit at the northwestern tip of the South Island on 1 January 2006 in which 8 died within a few hours of landing and the remaining 41 were shot, were missed opportunities to obtain important scientific information. It is also important that geographic mapping of local anthropogenic and biological noise is carried out, together with mapping of the distribution and abundance of cetaceans, to provide essential baseline information to identify potential areas and times of highest risk, and the initiation of evaluation of any relationship between populations and their distribution, and noise levels. Until there is better knowledge of whale deaths, the precautionary principle should be vigorously applied. The sound level in the front row of a Rolling Stones concert might be 120 decibels, which is 10,000 times louder than an alarm clock (80db). A seismic air gun array at 210db is a billion times louder than a Stones concert. At 250db it is 10 trillion times louder than the concert. Even with earplugs many rock fans and musicians have suffered hearing loss. Unfortunately it is not possible to fit marine mammals with earplugs. Guera, A., Gonzales, A.F. and Rocha, F., "A review of records of giant squid in the north-eastern Atlantic and severe injuries in Architeuthis dux stranded after acoustic exploration", Abstract and Presentation to the Annual Science Conference of the International Council for the Exploration of the Sea (2004). The study, which was led by the Canadian Department of Fisheries and Oceans, placed hundreds of crabs in modified lobster traps in order to observe the effects of two blasts of a seismic airgun at noise levels significantly lower than those typically generated by the seismic industry. Although differences in the control and test environments make further study necessary, researchers observed damage (including hemorrhaging and membrane detachment) in the crabs' livers and ovaries and development delays in their larvae. Fisheries and Oceans Canada, "Potential impacts of seismic energy on snow crab" (Sept 2004) (Draft Habitat Status Report). Copyright © 2005-2006 TerraNature Trust. All rights reserved.